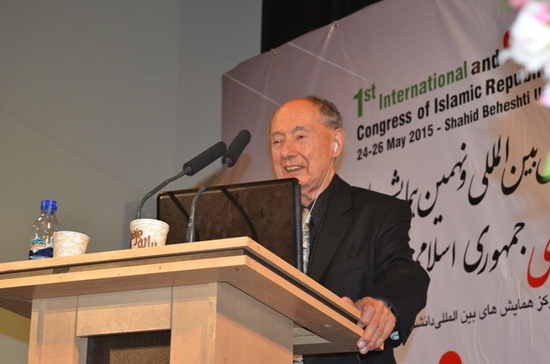 Dr. Marc Van Montagu, 2013 World Food Prize Laureate, has been awarded with the Iran Agriculture Gold Medal from H.E. Mahmood Hojjati, Agricultural Minister of the Islamic Republic of Iran, during the 9th Biotechnology Congress of Iran. The award was previously given to the late Dr. Norman Borlaug, the father of green revolution, and Dr. Gurdev S. Khush, a geneticist who has developed high yielding rice varieties. "The discovery of plant gene engineering technologies, now more than 30 years, has brought the hope that we will be able to construct the novel crops that classical breeding cannot procure in due time, not withstanding the progress in molecular genetics and mutagenesis…Today with the urgency of the problems of our planet we cannot longer wait. We can not delay any longer the use of the best of science and technology. For this we biotechnologists, have to learn and to understand why the society is afraid of innovation. How we can communicate about benefit/risk analyses and how we can help create confidence and cooperation between nations. Innovative technology is not sufficient. We live now in participative societies. Nobody wants to be excluded from opinion making. So explaining the methods of knowledge acquisition and the potentials of science is of as great importance as the scientific progress self."